As soon as you have a baby everyone wants to know how they are sleeping, how much sleep do they get, how long do they go overnight and how much sleep do you get? There are all common questions that everyone want to ask a sleep deprived mother of a newborn, I’ve even found myself doing it! I remember people asking me with Lucas, ‘Is he a good sleeper?’ and I’d say ‘No, Terrible!’ because in those early weeks I felt like I was getting no sleep, I remember some nights counting a couple of hours overall as a good night. It seemed to last forever when in actuality it was only a couple of months. This time round it has seemed easier; I don’t know whether it is that I knew what was coming and I was ready for the sleep deprivation or maybe just that I had a better idea of what worked and what didn’t but it does seem like these two little guys are great little sleepers. I tried to get into good habits from the start, but to be fair a lot of that was just circumstantial. I didn’t have the time to rock two babies to sleep or to let them curl up and nap on me (as much as I love it). They were in their own room quite early on but that was mostly due to there being no space in our bedroom. They also had a bedtime routine early on because Lucas does and it was easier to do it all in one and get them all down together. 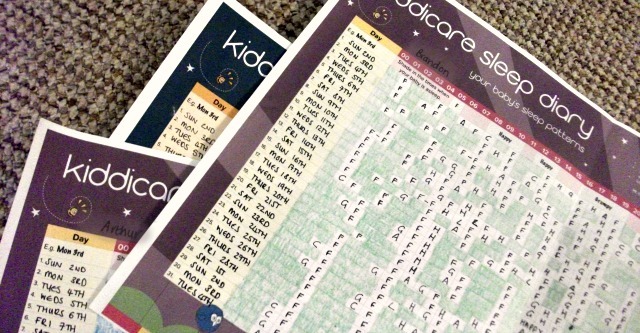 At the start of February I starting keeping my sleep diary for Kiddicare and in my first post I talked about the sleep techniques that worked for us. I kept track of both the boys sleeping and waking hours and their moods and the same for me. At first it seemed all over the place but gradually they started to get into a routine. Part way through we adjusted to try and have just one feed in the wee hours of the night and after a few rocky days it worked. They were piling the weight on so we knew they we were getting enough food and they seemed apathetic towards their first feed in the morning, showing signs they were ready to have less milk overnight. Towards the end of the diary they had really settled, they seemed to have happier periods and napped for longer which seemed to help them sleep for several hours overnight. Just as I finished the sleep diary the momentous night happened, we fed them at 10.30 as usual, put them down and they drifted off straight away. Next thing we knew it was 6.00 am; they hadn’t woke for their feed! We both woke with a start when we realised and peeped into their room to check on them; both happily fast asleep…ahh bliss! Since them there have been several nights that they’ve done the same and I can’t quite believe they have just done it on their own. I feel like all the hard work of sticking to the same bedtime, keeping the routine and feeding times the same has really paid off. They are in bed by 7pm, sleep until 10.30pm, feed, and then wake anytime between 5.30am and 7.00am. They are so content in the day; we try and stick to regular naptimes depending where we are and it really seems to bring out the best in them. They are full of smiles and gurgles when they wake and it makes me happy to see them so happy. It feels like a massive achievement; I remember feeling the same with Lucas that I had managed the impossible, that they know night time is for sleeping. That first time I get an uninterrupted nights sleep I face the next day with a real spring in my step!